American Civil Liberties Union. “Rodriguez, et al. v. Robbins, et al. – Prolonged Detention Fact Sheet.” https://www.aclu.org/other/rodriguez-et-al-v-robbins-et-al-prolonged-detention-fact-sheet. Accessed 30 March 2018. Andreas, Peter and Timothy Snyder, eds. The Wall Around the West: State Borders and Immigration Control in North America and Europe. Lanham: Rowman and Littlefield, 2000. Barkan, Joshua. Corporate Sovereignty: Law and Government Under Capitalism. Minneapolis: University of Minnesota Press, 2013. Blatter, Joachim K. “Debordering the World of States: Towards a Multi-Level System in Europe and a Multipolity System in North America? Insights from Border Regions.” European Journal of International Relations 7, no. 2 (2001): 175–209. Brenner, Neil. “Urban Governance and the Production of New State Spaces in Western Europe, 1960–2000.” Review of International Political Economy 11, no. 3 (2004): 447–488. Cairns, Stephen, ed. Drifting: Architecture and Migrancy. New York: Routledge, 2004. Cantor, Guillermo. “Hieleras (Iceboxes) in the Rio Grande Valley Sector: Lengthy Detention, Deplorable Conditions, and Abuse in CBP Holding Cells.” American Immigration Council. December 17, 2015. https://www.americanimmigrationcouncil.org/research/hieleras-iceboxes-rio-grande-valley-sector. Castells, Manuel. The Rise of the Network Society, The Information Age: Economy, Society and Culture Vol. I. Oxford: Wiley Blackwell, 1996. Chak, Tings. Undocumented: The Architecture of Migrant Detention. Montreal; Amsterdam: The Architectural Observer, 2014. Chaterjee, Partha. The Politics of the Governed: Reflections on Popular Politics in Most of the World. New York: Columbia University Press, 2004. Coleman, Mathew. “U.S. Statecraft and the U.S.-Mexico Border as Security/Economy Nexus.” Political Geography 24, no. 2 (2005): 185–209. Coleman, Mathew. “Immigration Geopolitics Beyond the Mexico-U.S. Border.” Antipode 95, no. 1 (2007): 54–76. Coutin, Susan B. Legalizing Moves: Salvadoran Immigrants’ Struggle for U.S. Residency. Ann Arbour: University of Michigan Press, 2000. Coutin, Susan B. “Contesting Criminality: Illegal Immigration and the Spatialization of Legality.” Theoretical Criminology 9, no. 10 (2005): 5–33. Cowen, Deborah. “A Geography of Logistics: Market Authority and the Security of Supply Chains.” Annals of the Association of American Geographer 100, no. 3 (2010): 600–620. Cowen, Deborah. The Deadly Life of Logistics: Mapping Violence in Global Trade. Minneapolis: University of Minnesota Press, 2014. De Genova, Nicholas. “The Legal Production of Mexican/Migrant ‘Illegality.’” Latino Studies 2 (2004): 160–185. DeLanda, Manuel. War in the Age of Intelligent Machines. New York: Swerve Editions, 1991. Deleuze, Gilles and Félix Guattari. Nomadology: The War Machine. Translated by Brian Massumi. Cambridge, MA: MIT Press, 1986. Easterling, Keller. “Zone: The Spatial Softwares of Extrastatecraft.” Places Journal (June 2012), https://doi.org/10.22269/120610. Edwards, Paul N. The Closed World: Computers and the Politics of Discourse in Cold War America. Cambridge, MA: MIT Press, 1996. Edwards, Paul N. “Infrastructure and Modernity: Force, Time, and Social Organization in the History of Sociotechnical Systems.” In Modernity and Technology, edited by Thomas J. Misa, Philip Brey, and Andrew Feenberg, 185—224. Cambridge, MA: MIT Press, 2003. Easterling, Keller. Enduring Innocence: Global Architecture and Its Political Masquerades. Cambridge, MA: MIT Press, 2005. Flynn, Michael. “From Bare Life to Bureaucratic Capitalism: Analyzing the Growth of the Immigration Detention Industry as a Complex Organization.” Contemporary Readings in Law and Social Justice 8, no. 1 (2016): 170–97. Flynn, Michael. “Kidnapped, Trafficked, Detained? The Implications of Non-state Actor Involvement in Immigrant Detention.” Journal on Migration and Human Security 5, no. 3 (2017): 593–613. Foucault, Michel. Discipline and Punish: The Birth of the Prison. Translated by ‎Alan Sheridan. New York: Vintage Books, 1979. Gilbert, Liette. “Immigration as Local Politics: Re-Bordering Immigration and Multiculturalism through Deterrence and Incapacitation.” International Journal of Urban and Regional Research 33, no. 1 (March 2009): 26—42. Graham, Stephen. Cities Under Siege: The New Military Urbanism. London: Verso, 2010. Griffin, Michael. Olympiodorus: Life of Plato and On Plato First Alcibiades 1–9. London: Bloomsbury, 2015. Guarnizo, Luis Eduardo and Michael Peter Smith, eds. Transnationalism from Below: Comparative Urban Research. Bloomington: Indiana University Press, 2013. Hanley, Richard, ed. Moving People, Goods, and Information in the 21st Century: The Cutting-Edge Infrastructures of Networked Cities. Milton Park; New York: Routledge, 2004.
to the United States. Berkeley: University of California Press, 2008. Hernández-León, Ruben. “Conceptualizing the Migration Industry.” In The Migration Industry and the Commercialization of International Migration, edited by Thomas Gammeltoft-Hansen and Ninna Nyberg Sørensen, 24—44. New York: Routledge, 2013. Hoerder, Dirk and Nora Faires, eds. Migrants and Migration in Modern North America: Cross-Border Lives, Labor Markets, and Politics. Durham, NC: Duke University Press, 2011. Hollifield, James, Valerie F. Hunt and Daniel J. Tichenor. “The Liberal Paradox: Immigrants, Markets and Rights in the United States.” SMU Law Review 61, no.1 (Winter 2008): 67–98. Jessop, Bob. State Theory: Putting Capitalist States in their Place. University Park, PA: Pennsylvania State University Press, 1990. Johnston, Norman. Forms of Constraint: A History of Prison Architecture. Chicago: University of Illinois Press, 2006. Kim, Anna J., Josh M. Levin and Nisha D. Botchwey. “Planning with Unauthorized Immigrant Communities: What Can Cities Do?” Journal of Planning Literature 22, no. 1 (2018): 3–16. Kreuder-Sonnen, Christian and Bernhard Zangl. “Which Post-Westphalia? International Organizations Between Constitutionalism and Authoritarianism.” European Journal of International Relations 21, no. 3 (2015): 568–594. Larson, Erik. “Captive Company.” Inc., June 1, 1988. https://www.inc.com/magazine/19880601/803.html. LeCavalier, Jesse. The Rule of Logistics: Walmart and the Architecture of Fulfillment. Minneapolis; London: University of Minnesota, 2016. Lee, Vivian. “’Please, God, Don’t Let Me Get Stopped’: Around Atlanta, No Sanctuary for Immigrants.” New York Times, November 25, 2017, https://nyti.ms/2jZtz8o. Levinson, Marc. The Box: How the Shipping Container Made the World Smaller and the World Economy Bigger. Princeton: Princeton University Press, 2006. Lopez, Sarah Lynn. The Remittance Landscape: Spaces of Migration in Rural Mexico and Urban U.S.A. Chicago; London: University of Chicago Press, 2015. Lopez, Sarah Lynn. “States of Incarceration: an Architectural Perspective on Immigrant Detention in Texas.” Museums & Social Issues 12, no. 1 (2017): 33–40. Lyster, Clare “Landscapes of Exchange: Re-articulating Site.”’ In The Landscape Urbanism Reader, edited by Charles Waldheim, 219—237. New York: Princeton Architecture Press, 2006. Mattelart, Armand. L’Invention de la Communication. Paris: Éditions La Découverte, 1994. Mitchell, Katharyne. Crossing the Neoliberal Line: Pacific Rim Migration and the Metropolis. Philadelphia: Temple University Press, 2004. Nevins, Joseph. Operation Gatekeeper: The Rise of the ‘Illegal Alien’ and the Making of the U.S.-Mexico Boundary. London: Routledge, 2002. Odem, Mary E. “Unsettled in the Suburbs: Latino Immigration and Ethnic Diversity in Metro Atlanta.” In Twenty-First Century Gateways: Immigrant Incorporation in Suburban America, edited by Audrey Singer, Susan Hardwick, and Caroline B. Brettell, 105—136. Washington DC: Brookings Institute, 2008. Odem, Mary E. “Subaltern Immigrants.” Interventions 10, no. 3 (2008): 359–380. Parker, Alison. “Lost in Detention: Where Suspects, by the Thousands, Disappear.” March 2015. The Marshall Project. https://www.themarshallproject.org/2015/03/04/lost-in-detention. Penn State Law Center for Immigrant Rights, Imprisoned Justice. “Inside Two Georgia Immigrant Detention Centers (Report).” Atlanta: Project South, 2017. https://projectsouth.org/wp-content/uploads/2017/06/Imprisoned_Justice_Report-1.pdf. Portes, Alejandro and Ruben G. Rumbaut. Immigrant America, 3rd Edition. Berkeley: University of California Press, 2006. Pratt, Anna. Securing Borders: Detention and Deportation in Canada. Vancouver: University of British Columbia Press, 2005. Price, Patricia L. “Postcards from Aztlán.” In Rituals of Mediation: International Politics and Social Meaning, edited by Francois Debrix and Cynthia Weber, 49—66. Minneapolis: University of Minnesota Press, 2003. Ramos, Stephen J. “Planning for Competitive Port Expansion on the U.S. Eastern Seaboard: The Case of the Savannah Harbor Expansion Project.” Journal of Transport Geography 36 (2014): 32–41. Sadowski-Smith, Claudia. Globalization on the Line: Culture, Capital, and Citizenship at U.S. Borders. New York: Palgrave, 2002. Sandoval, Gerardo Francisco. “Immigrant Integration Models in ‘Illegal’ Communities: Postville Iowa’s Shadow Context.” Local Environment 20, no. 6 (2015): 1–23. Schivelbusch, Wolfgang. The Railway Journey: The Industrialization of Time and Space in the Nineteenth Century. Berkeley: University of California Press, 1986. Sheffi, Yossi. Logistics Clusters: Delivering Value and Driving Growth. Cambridge, MA: MIT Press, 2012. Singer, Audrey. “The Rise of the New Immigrant Gateways.” Washington DC: Brookings Institution, 2004. Sparke, Matthew B. “A Neoliberal Nexus: Economy, Security, and the Biopolitics of Citizenship at the Border.” Political Geography 25, no. 2 (2006): 151–180. Stephens, Lynn. Transborder Lives: Oaxacans in Mexico, California, and Oregon. Durham, NC: Duke University Press, 2007. Stevens, Jacqueline. “Introduction.” In Citizenship in Question: Evidentiary Birthright and Statelessness, edited by Benjamin N. Lawrence, Jacqueline Stevens, 1—26. Durham; London: Duke University Press, 2017. Stevens, Jacqueline. “When Migrants are Treated Like Slaves.” New York Times, April 4, 2018. https://nyti.ms/2EjFeUc. Tidwell Cullen, Tara. “ICE Release Its Most Comprehensive Immigration Detention Data Yet. Here’s What We Learned from It.” March 13, 2018. National Migrant Justice Center. http://immigrantjustice.org/staff/blog/ice-released-its-most-comprehensive-immigration-detention-data-yet. Accessed 28 March 2018. 30. Stanford: Stanford University Press, 2010. Varsanyi, Monica W. “Neoliberalism and Nativism: Local Anti-Immigrant Policy Activism and an Emerging Politics of Scale.” International Journal of Urban and Regional Research 35, no. 2 (2011): 295–311. Vitiello, Domenic. “The Migrant Metropolis and American Planning.” Journal of the American Planning Association 75, no. 2 (2009): 245–55. Wiener, Norbert. Cybernetics, or Control and Communication in the Animal and the Machine. Cambridge, MA: MIT Press, 1948. Wiener, Norbert. The Human Use of Human Beings: Cybernetics and Society. Boston: Houghton Mifflin, 1954. Walters, William. “Border/Control.” European Journal of Social Theory 9, no. 2 (2006): 187–203. Stephen J. Ramos is an Associate Professor in Urban Planning and Design at the University of Georgia College of Environment and Design. He is author of Dubai Amplified: The Engineering of a Port Geography (Ashgate, 2010), and co-editor of Infrastructure Sustainability and Design (Routledge 2012). He is a founding editor of the journal New Geographies, and editor-in- chief of New Geographies Volume 1: After Zero (Harvard University Press, 2009). His writing has appeared in the Harvard Design Magazine, Volume, Journal for Transport Geography, Planning Perspectives, and Journal of Urban History. Stephen holds a Doctor of Design degree from the Harvard Graduate School of Design. His professional practice includes work with the Fundación Metrópoli in Madrid, the International Society of City and Regional Planners in The Hague, and NGO work throughout Latin America. RAMOS, Stephen. ICEBOX. FOOTPRINT, [S.l. ], p. 53-68, nov. 2018. ISSN 1875-1490. Available at: <https://journals.open.tudelft.nl/index.php/footprint/article/view/2041>. Date accessed: 21 apr. 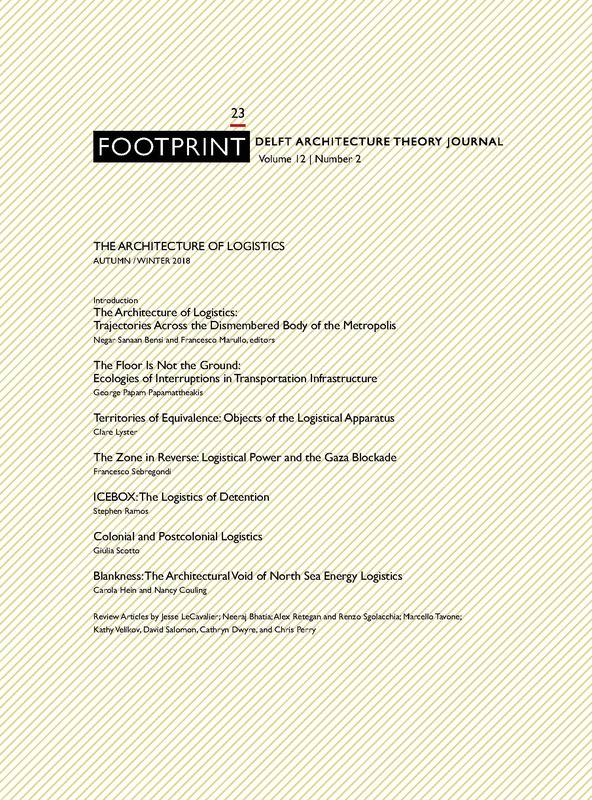 2019. doi: https://doi.org/10.7480/footprint.12.2.2041.